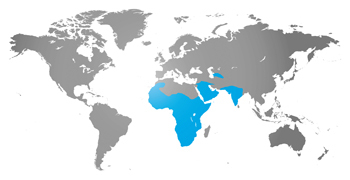 You can find the honey badger throughout the continent of Africa on mainly dry terrains, but also occasionally in wetlands and grasslands. Although they have a “sweet spot” for honey, honey badgers also eat rodents, birds, lizards, insects, turtles, snakes, and fruits. At the zoo, they eat meat, rats, insects, and commercial cat food. Honey badgers have a black body with a whitish hood beginning on the head and continuing in a wide stripe down the length of the body. The legs are short but muscular and the body is very stocky, weighing in around 15-30 pounds. They also have incredibly thick skin that can avoid injury from arrows and even dog bites. Honey badgers are active around dusk and overnight, but are also awake during the daytime hours. These animals are particularly ferocious hunters and are no stranger to fights with venomous snakes. Honey badgers are often found near human settlements, where they chew through fences, even wire mesh, to gain access to henhouses or other enclosures. The honey badger’s sweet tooth makes it unpopular with people who keep raise bees for their honey. Some beekeepers kill any honey badger they see just to protect their beehives. However, since honey badgers can’t jump, many beekeepers have found that simply securing the beehives a few feet higher off the ground discourages the animals from climbing up to reach them and keeps the bees and their honey safe. With long claws, the honey badger digs burrows up to 9 feet (3 meters) long and up to 5 feet (1.5 meters) deep. A single tunnel ends in a chamber, which is usually bare, where the honey badger rests. But when it comes to making a home, honey badger aren’t afraid to use what’s already available to them: rock crevices and holes under tree roots, old termite mounds, or the dens of other animals such as aardvarks. Burrows made by Cape foxes, bat-eared foxes, yellow mongooses, and springhares are also taken over by the honey badger. Honey badger babies are called whelps. The gestation period is thought to be 6 months, although not much is known about the reproductive habits of these animals. The female honey badger is left alone to give birth and raise her young after the breeding season in September and October. The expectant mother digs a nursery chamber and lines it with grass for her babies. After a gestation period of six to eight weeks, one cub (rarely two) is born in April or May. The newborn is hairless with pink skin and closed eyes. At one week of age its skin begins to change from pink to gray; two weeks later, fine gray hair begins to grow. The familiar white stripe appears about a week after that. By the time the cub is close to three months old, it has become a perfect miniature version of its parents. Honey badgers are known as ratels in South Africa. The South African military named their armored tanks “ratels” after this fearless and ferocious animal.